My little family is planning a backpacking adventure over the summer. Two weeks in and out of the wilderness. Considering not long ago I was what could be referred to as a couch potato (without a TV but with a computer) the idea of a trek through the wilderness is mildly amusing. Originally we thought we’d do a section of the Colorado Trail and then looked at taking the Durango & Silverton train into the wilderness and hiking a big loop. Both looked great but we soon discovered both were way too ambitious with our 9 year old son in tow. Several sources indicate a half mile per day per year of age when hiking or backpacking with children. We’d be limited to an average of 4.5 miles per day. On the Colorado Trail we planned to hike segments 25 through 28, which total 73.9 miles plus we needed to hike an extra 5.8 miles in segment 24, from Elk Park to Molas Pass to access the trail. So that would make our trip 79.7 miles. At 4.5 miles per day we’d need 18 days to complete the section. And according to the guidebook we ordered there was a 20 mile section without water. Most people try to hike through that as quick as possible. We’d be challenged to be able to carry enough water to take the needed 4 days through this section. The loop is a more manageable 38.6 mile trek which we could complete in 9 days. Our son really liked the idea of this one since the trail would drop us off at the starting place and pick us up at the ending place. We ordered a different guide book detailing this hike and 58 other hikes in the Weminuche and South San Juan Wilderness areas. Looking at this guide book helped us see just how many hiking options we had! We’ve decided on choosing a couple of smaller loops that would only put us out one overnight on each, we’ll do a full round trip train ride and then move on to other sights we want to see in Colorado including Mesa Verde, Great Sand Dunes, and hiking Pike’s Peak. You may be wondering why we’re planning a trip to Colorado for hiking when there are excellent hiking opportunities near our home in Wyoming in the Big Horn Mountains and the Absaroka-Beartooth Wilderness. We could hike for weeks on end in either of these places. We’re going to Colorado for my 30th Class Reunion (yes, 30th. I can’t believe it) and wrapped our hiking adventure into this trip. When we first started talking about a big hiking adventure over the summer of 2018, I knew I’d need to make some changes within my body to be able to take the trip without being miserable. The sad fact is, I’m overweight. According to the BMI calculator thing when we first started planning our adventure my weight put me in the obese category. YIKES. After my fourth child was born I struggled to take off the baby weight. Over the years I’ve tried many different diets. For 10 years or so I tried many different “plans” based on low fat, high carb principles. These worked to lose weight but I was miserable and starving all of the time. Once I’d start eating normally again i’d gain back the weight I’d lost and those pounds brought a few friends along with them. In early 2009, when we switched to whole/real/traditional foods, I worked part time and was very active on our small farm (moving chickens around and hauling water is hard work!). I lost 40 pounds without much effort. Then I started working full time as a virtual assistant. Sitting for the majority of my day, instead of working in the yard, brought those pounds back. For a while I didn’t worry too much about my weight as it held steady at a number I could live with. Mostly. My lifestyle was fairly sedentary and the extra weight didn’t seem a big deal. At the beginning of this year, I started Trim Healthy Mama. I’d done THM for about six weeks last year, mainly to help with balancing hormones as opposed to weight loss, and it went well. My sweet husband joined me this time doing Trim Healthy Mama so he could also lose weight four our hiking adventure and to make it easier for meal planning and prep. Our son ate the same way we did but we added either extra carbs or fats to his meals. I shared my meal plans most weeks for THM. You can find these here plus additional information on THM and how it works. I really liked THM. While there are a few rules, like only eating one type of fuel at a time, I like the variety and the fact I could eat most things. From January 1 to March 15 I lost 7 pounds. Not a huge amount, but not terrible. Plus, I did notice a wonderful stabilizing of my mood (hormone balancing) and a decent amount of energy. Joe was a different story. He had a hard time grasping how the plan worked. He didn’t understand the differences between S Meals and E Meals. And he found that since he didn’t understand how it worked it wasn’t really worth trying. While I lost 7 pounds during those two and a half months, he put on around fifteen pounds. When Joe and I were married he was at his lowest adult weight. Starting in high school he struggled with his weight, easily putting weight on. About 5 years before we met he started doing the Atkins Diet. This worked very well for him and he lost about 45 pounds and had kept it off for 5 years. When we got married he stopped Atkins and each year his weight has crept up. By mid-March his weight has reached an all time high. Joe asked if I would mind if we tried Atkins together. On April 1 we started Phase 1, also called Induction, of Atkins. We started with Phase 1 because of the amount of weight each of us wanted to lose. Joe wants to lose 85 pounds. Since I had already lost 7 pounds of my 36 pound goal via THM I needed to lose 29. Since we each wanted to lose more than 14 pounds Phase 1 was recommended. Atkins is a low carb diet. In Phase 1 carbs are limited to 20 grams per day with 12 to 15 originating from cooked and raw vegetables. This means lots of high-fat, high-protein, with low-carb vegetables like leafy greens. The “rules” are simple so there isn’t much to think about. What’s for breakfast? Meat and non-starchy veggies. What’s for lunch? Meat and non-starchy veggies. What’s for supper? Meat and non-starchy veggies. Pretty easy! Our son is not on Atkins with us so he’s eating a reasonable amount of carbs. Phase 1 lasts a minimum of 2 weeks with the recommendation of staying in Phase 1 until 15 pounds from goal weight. After the first 2 weeks, nuts and berries can be included in the 20 carb per day limit. I can’t tell you how good a few almonds or a smidge of peanut butter tasted after not having those for a few weeks! Joe has been pretty strict about staying at his 20 carbs per day. I was gone the first week of May for work and while I mostly stuck with 20 carbs per day I did have a couple of splurge meals. As of last Wednesday Joe has lost 30 pounds. I’ve lost an additional seven. The more overweight a person is, the faster they can lose so both Joe and I expected him to lose considerably more than me in the same amount of time. Truthfully, he gains weight easier than I do also. I shared weekly menu plans during our Trim Healthy Mama time mainly because I was making a weekly menu to help us stay on plan. Because Atkins is so simple, I’m not menu planning. Instead each night Joe, the breakfast chef, asks “What kind of meat do you want for breakfast?” Then he pulls it out of the freezer. I ask the same question after breakfast about supper. Joe’s at work during lunch time so he takes along boiled eggs, meat and/or cheese. I’m at home and scrounge something up from leftovers or whatever. Lately I’ve been enjoying a modified fat bomb at lunch of a teaspoon peanut butter, coconut oil and sour cream along with celery. With a goal weight loss of 36 pounds, and down 14 (7 during THM and 7 since starting Atkins), I have 22 pounds to go. Once I reach 15 pounds from my goal weight I’ll move on to Phase 2 and start climbing the carb ladder. A fun way of saying I’ll add 5 carbs a week to determine my carb tolerance and continue on weight loss. At the first of the year I upped my exercise. I’m not just adding opportunities for movement but taking a time for concentrated exercise. Every day I do something. It may be an online work out video (I like the Bunny Slope Beginner Workout Program which includes light weights, this 20 minute Zumba Strong, and this regular Zumba), a class at our community center (they offer Zumba three time per week and yoga two times per month), a class on Healthy Moving (some of these I really feel!) or an evening walk with my husband. Quite often I’ll combine exercises to do more than one such as 20 minutes of Zumba and a 15 or 20 minute Healthy Moving class. On the weekends, we try to do something fun as a family. Over the winter this was skiing or snowshoeing. With the better weather, we’re hiking and planning overnight local backpacking trips (as soon as the weather allows). I’m also planning a kayaking trip with friends and looking into purchasing a paddle board, but that may wait until next summer. Joe enjoys jogging. He takes it very slow right now with his excess weight to prevent injury. Joe plans to run a few 5K events this summer. Preparing for these is part of his focus. While losing weight and preparing for our hiking trip was the original goal, we now have the intention of being healthy, strong, active and full of energy for life. Being healthy is something we want to do not just for our short term desires but for our children, grandchild and future grandchildren. We want to enjoy our lives with our family. We live in an area that has many retired persons. Most of them have the vitality mentioned in this definition. Joe’s parents are another excellent example of this. They take long walks (as in many miles) almost every day. When the weather is inclement they use the treadmill. Our adult children and their spouses are another inspiration. Several of them have really started taking charge of their health. Experiencing their excitement has really spurred us along. We also have a desire to do more long term hikes with the full Colorado Trail someday being a possibility, plus other even longer trails. Dare I dream about some day hiking the Pacific Crest Trail? Some days are easier than others. My daily workouts have been a challenge lately. We’re having construction done in our house. As a result I have to be creative to fit it in around that and my own work schedule. Joe works split shifts which also makes for a challenge to find a workout time. We often have to give each other pep talks and reminders as a way of encouragement. We also talk a lot about how much better we already feel and how much easier our summer trip will be carrying around less weight. 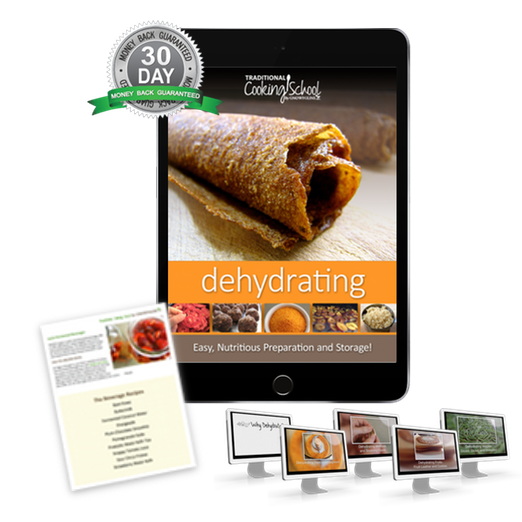 Learn how to dehydrate healthy traditional foods from Wardee at Traditional Cooking School. Great info not only for the trail but preserving the summer bounty, long-term storage and more. Learn more here.